BAYAN USA 6th Congress Sept 15-16 2018 NYC! 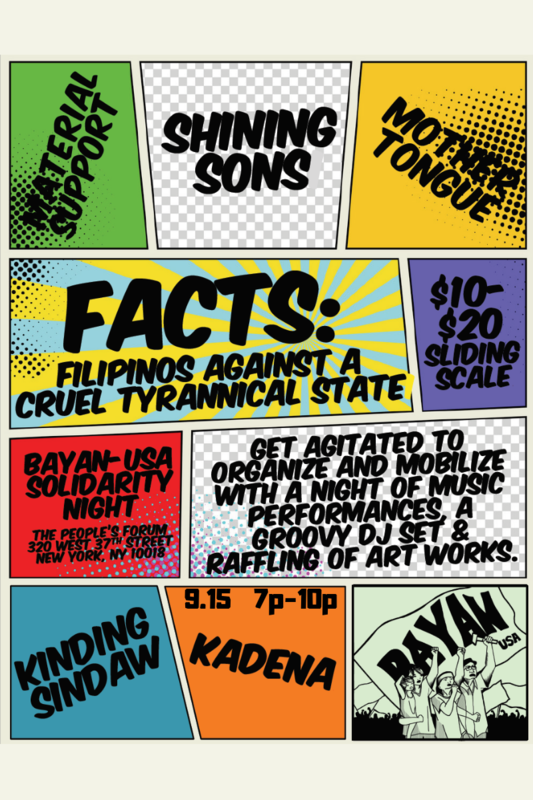 As you may know, BAYAN USA will be hosting its 6th National Congress this weekend Sept 15-16 in New York! Online Registration will close Sept 10th, 2018. However, you can still register at the door starting on Saturday Sept 15th at 8am! There are some parts of the weekends events that are OPEN TO THE PUBLIC! Please share these widely! 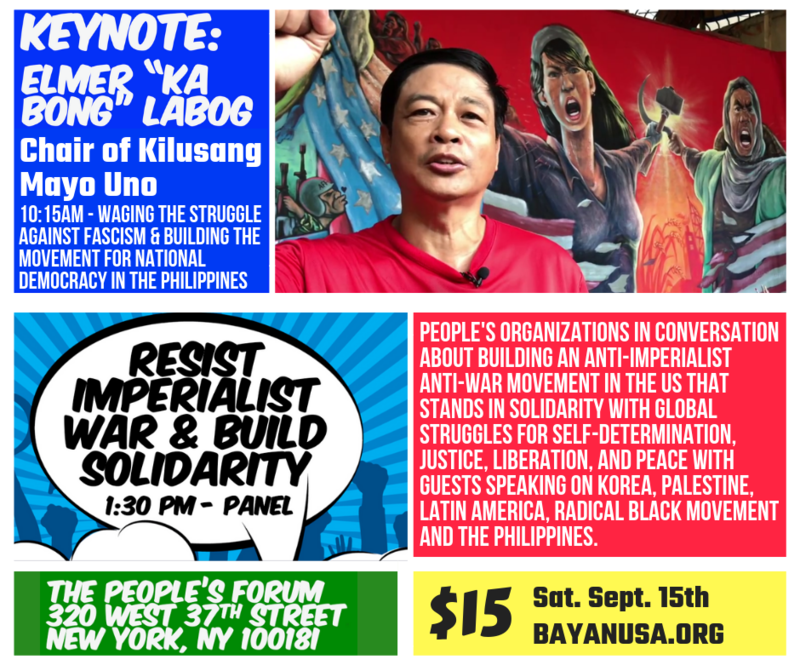 BAYAN USA Congress Day 1 will have our Keynote Speaker Elmer “Ka Bong” Labog Chairperson of Kilusang Mayo Uno and Vice Chair of Bagong Alyansang Makabayan (BAYAN) and the Resist Imperialist War & Build Solidarity Panel with special guest speakers! In the evening we will host our Solidarity Night Music and Raffle event (see details in flyer)! 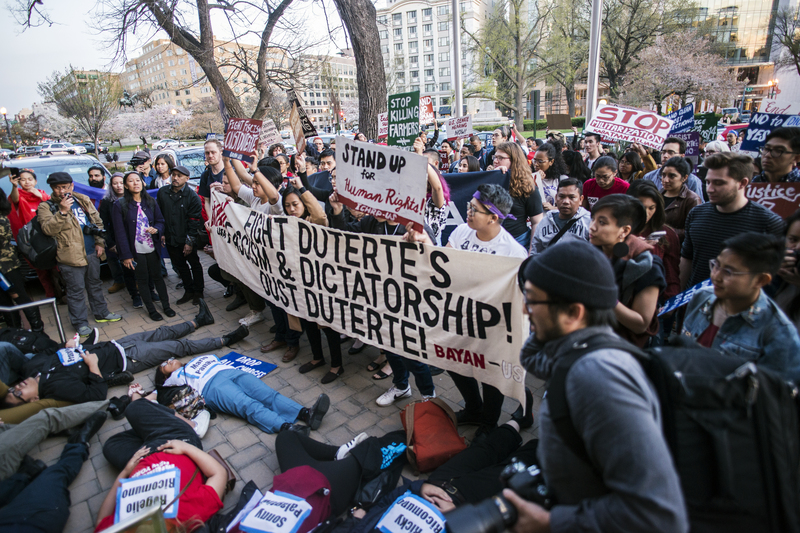 In addition to the BAYAN USA Congress, BAYAN USA is taking to the streets and calling for a mobilization action in front of the Philippine Consulate in New York City on Sept 16th. We invite all friends, allies and supporters of the Filipino people’s continuing struggle for genuine sovereignty and democracy to join us as we celebrate the conclusion of our 6th congress with march and rally against US-backed fascism in the Philippines under the Duterte regime. Click here: FB event. We will march to the Philippine Consulate at 556 Fifth Avenue, between 45th and 46th Streets, where we will hold a program.